Check our list of the best indie games for more like this. Gosh. 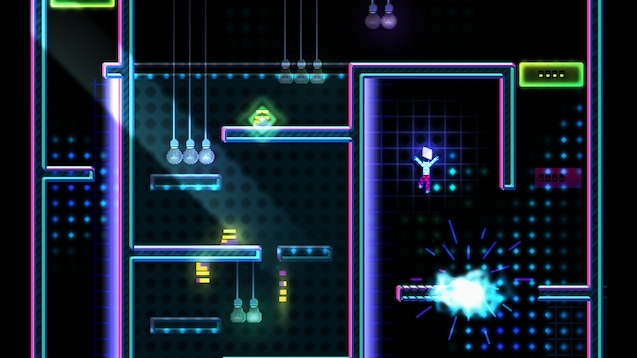 In it, you bound through 2D environments to the beat, working your way up a hex grid filled with threats, adding your own platforms to the level architecture as you make your way higher. Everything you do adds percussion or other layers to the soundtrack that backs the action. You surf the platforms you make horizontally and pop bottles along to the beat – presumably for a higher score, though that is not clear. More on that later. You jump up, create another platform, then bound off and run across a neon strip, avoiding hazards while collecting flowers and adding a jingle to the soundtrack before bounding off again. It is bliss when it all comes together. 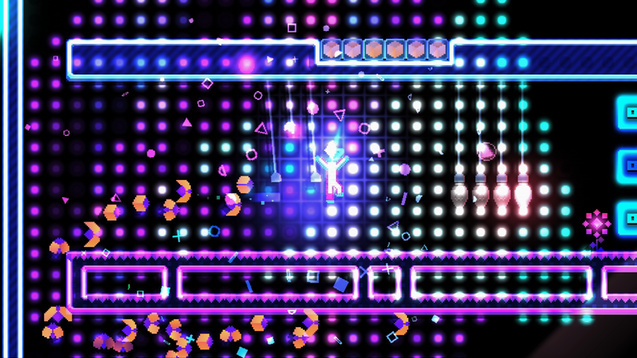 I could not stop thinking about Rez when I was playing Octahedron. It has the same otherworldly quality, the same imperative to get through its levels with style, with rhythm. When playing with a controller you use the right trigger to create a platform. Hold it and walk and you surf the platform through the sky. Jump up and press the button and you create a new platform to jump higher still. You can only create a set number of platforms before you hit the ground, so you have to figure out how to get where you need to go with what you have. To make things more difficult the platforms vanish after a few seconds – you need to constantly be on the move. Later, you get access to other types of platforms. The one I tried allows you to fire at enemies or destructible scenery below you, opening up new paths or getting rid of threats, and you often have to switch between these two functions in mid-air. Only the most dexterous players need apply because Octahedron is not messing around. I do not have an issue with Octahedron’s difficulty but the build I played did have one major fault. This is one of those games that wants you to master it. It wants you to play levels over and over again to beat your scores. Unfortunately, the mission end screen is a mess of numbers and symbols. It might as well be hieroglyphics for all the information it tries to present you, and none of it appears to be of much use. This lack of readability extends to the game itself. 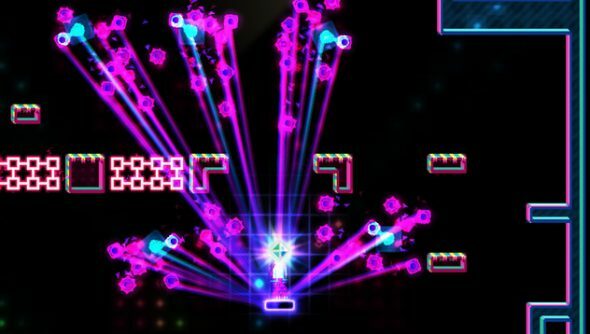 The visual design is kept in line with the basic lines and geometry of retro arcade classics, and isn’t shy about using bright colours, so it takes a while to be able to parse what every little shape does. The answer, by the way, is that most of them want to kill you. But how exactly does a small red triangle try to murder you? That is what you have to figure out while dodging around at breakneck speed. If this issue can be addressed before release, it would be a game to recommend to people who love the likes of Super Hexagon (and, presumably, don’t mind tearing out their hair). What is game developers’ fascination with using shapes to make us cry anyway?